Earlier this month we introduced the preview of Q&A for Power BI iOS app, and while we've received amazing feedback so far, we'd still love to hear from you in the Power BI community thread. Speaking of previews, with this release we are happy to announce that the Power BI app for Android tablets is now available globally! Thank you for your feedback during preview. Read on to learn about more new capabilities and improvements to the Power BI mobile app for all platforms. We have added a new* menu for dashboard tiles that enables you to quickly navigate and act directly from the dashboard. To access this menu, just tap and hold on a tile in a dashboard, or tap the ellipsis (…). The menu allows you to navigate directly to the underlying report, expand the tile, or even manage an alert for the tile if the type supports it. If your tile has a custom link, you can now navigate to it directly from the dashboard. * Note: This menu is new for iOS, Android phones in landscape orientation, and Android tablets. The menu was already in place for Windows and Android phones in portrait modes. Many of you have more than one SQL Server Reporting Services server that you want to connect to while on the go. 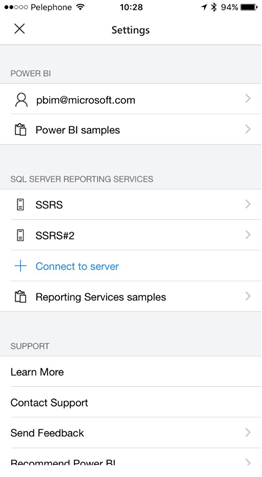 Up until now, connecting to different SSRS servers using Power BI mobile apps required you to delete your connection to the server and then re-add them one at a time. But not anymore — with this release, you can connect to up to five different SQL Server Reporting Services servers at the same time! All the servers you connect to will be available under the settings screen. Imagine that you have a bar chart in your report that shows a lot of data points. How would you browse between those points? 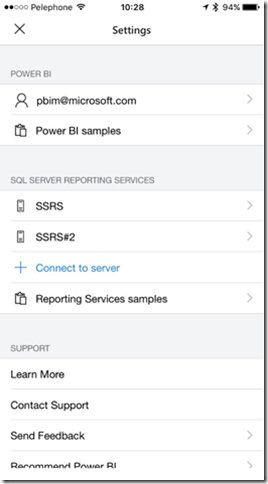 It's easy to do using the mouse in the Power BI service, but on your mobile device it can be trickier to scroll through your report’s visual to find the right point. That's why in this release we added the ability to scroll in any Cartesian chart (Bar, Colum etc) by touching the chart itself, rather than touching the scroll bar. This new interaction is available in any visual in a report, report focus mode, phone report, or Q&A tile. That’s all for this update! We hope you enjoy these new and improved mobile features, and continue sending us valuable feedback about our product. 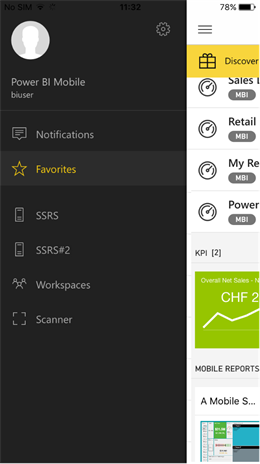 Please don’t forget to vote for features that you’d like to see included in the Power BI mobile apps in the future.